The ancient city of Segovia is located in Spain’s north-western region of Castilla y Leon, about a 45-minute drive away from Madrid. 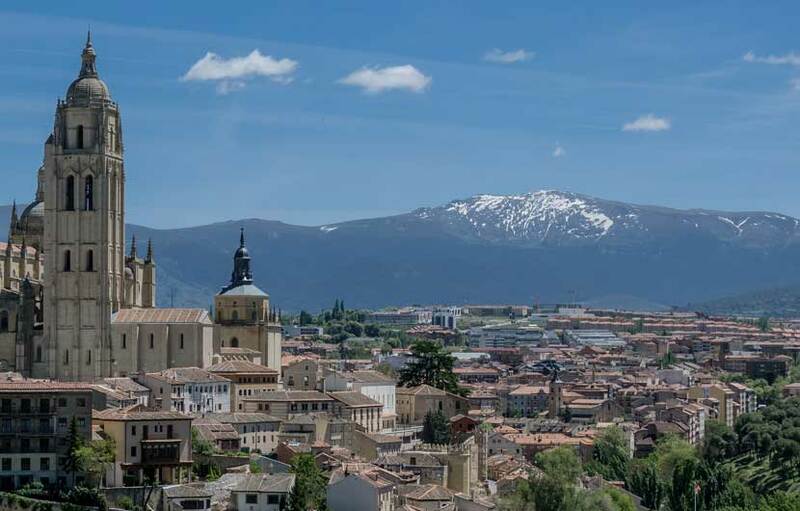 Flanked by the great Guadarrama Mountains and its snowy peaks, this relatively small yet very historic city marks its territory en-route to the Camino de Santiago, leaving Madrid and coming to a spectacular end at Santiago de Compostela, in Galicia. 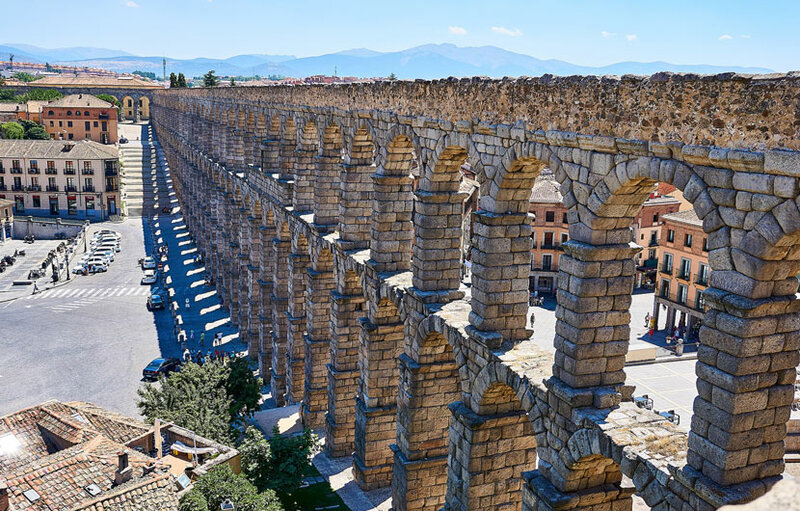 As most of north-western Spain, there is a strong history of Celtic occupation, as well as stunning feats of Roman legacies, such as the incredible Segovia Aqueduct, which is a UNESCO World Heritage site. As soon as you arrive in Segovia, you will find a bright, serene and airy city, whose honey-coloured buildings and marvelous historical sites, charm and vibrant cultural life and the gorgeous canyons around the River Doratón and its small valleys. 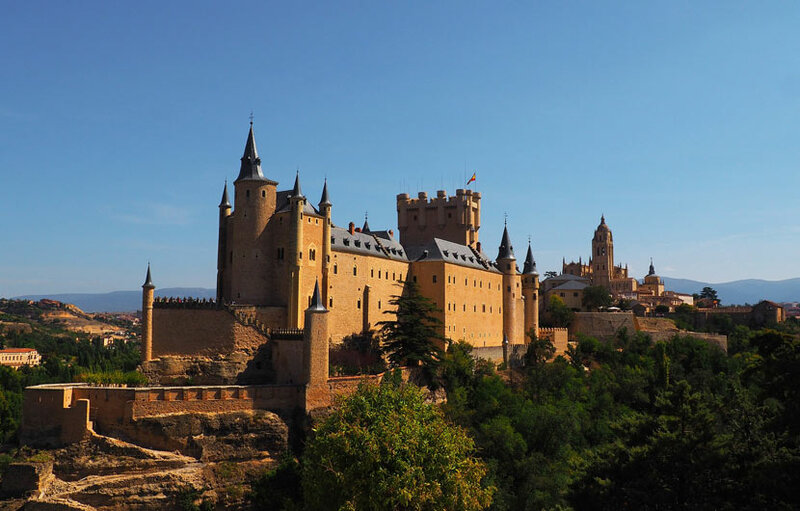 We have compiled a comprehensive Spain travel resources page to help you plan and book a trip or holiday to Segovia with a budget busting hotel search comparison platform, travel insurance, low cost flights, discount car hire, tours, excursions as well money saving travel and holiday deals. 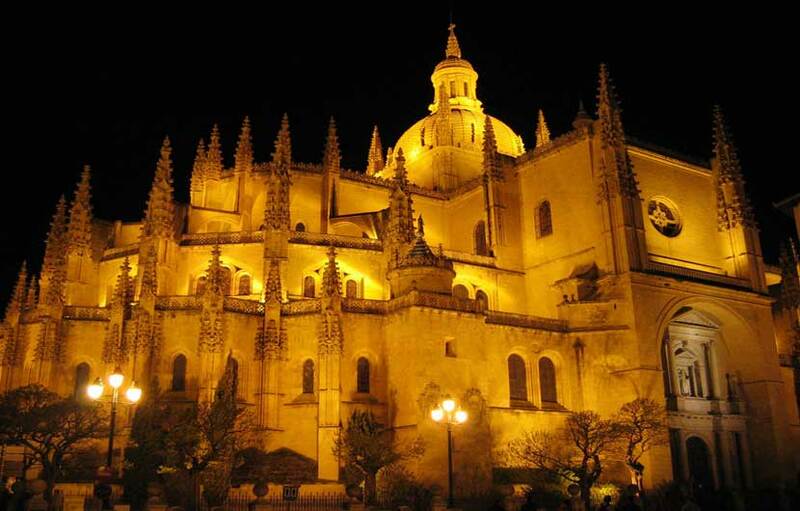 The Segovia Cathedral, the long-time residence of many Castilian Royal figures. The Alcazar de Segovia (dating back to the 12th century). The Walls, a true legacy from the short-lived Moorish intervention in northern Spain. The Royal palace of Segovia was first documented in 1122. Segovia is one of highest cities in Spain with an average altitude of 750 meters. Segovia was built by the Romans in the first century AD and is a UNESCO World Heritage Site. The cities walls which where built in the 11th century are still standing today. Built more then 2000 years ago, the Segovia aqueduct it still remains in working order to this very day. Get your comfortable shoes, camera, and start at Calle Real, a lovely pedestrian street where you’ll find many interesting places such as: Palacio de los del Río, Palacio de los Torreagero, Palacio del Conde de Alpuente, Casa de los Picos or the Church of San Martin. Segovia is a green city – indeed, the great number of parks and artistic gardens, many of which are steeped in history, fill the city with warmth and aroma; a little lush oasis in the middle of a parched Spanish inland landscape. The most important and known historical monument of Segovia and living proof of Roman ingenuity, measuring about 800 meters, making it one of the best preserved Roman aqueducts worldwide. Built in Gothic Renaissance style, it majestically reigns in Plaza Mayor. another emblem of Segovi which stands out due to its large size but also by its overwhelming beauty. 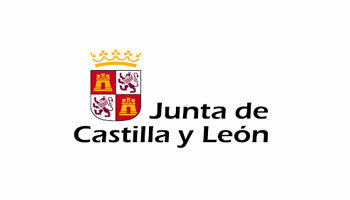 It houses a museum, where the first printed book in Spain can be seen, it was created in 1472 and is property of el Sinodal de Aguila fuente. The most impressive and elegant fortress in the region due to its imposing shape and the style in which it was built, thought to have Celtic and Roman origins. Well worth climbing its 150 steps to enjoy a spectacular view over the city. A stroll around the Old Part which, most distinctively of Spain’s old towns, features many small, cosy eateries, serving up the crème-de-la-crème of local delights. 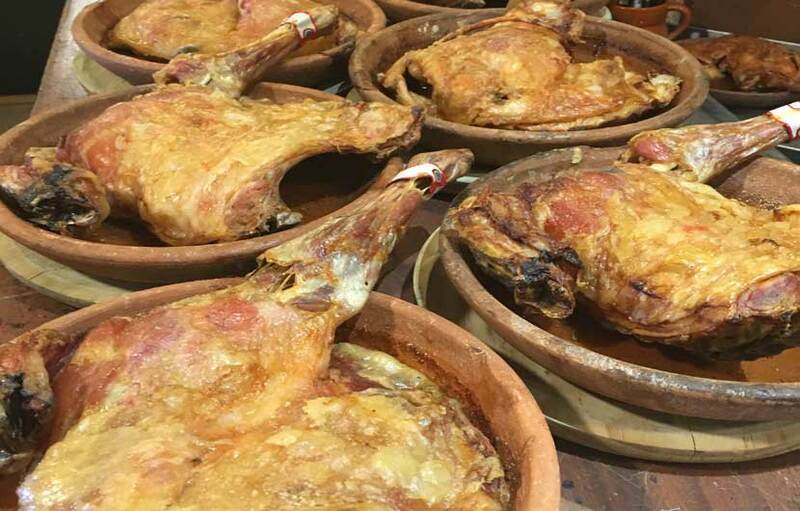 The Segovian gastronomy enjoys many succulent dishes, such as the oven cooked baby suckling pig and the quality roast meats, be it beef, pork or lamb. 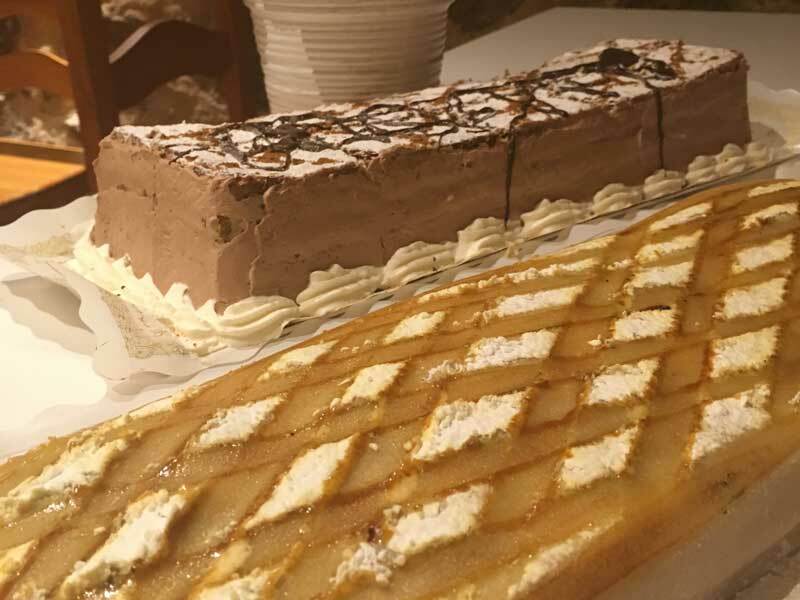 Segovia is also well known for its pastries, such as the delicious Ponche segoviano or Leche frita. Here is a selection of highly recommended Segovian restaurants show serve traditional regional cooking. 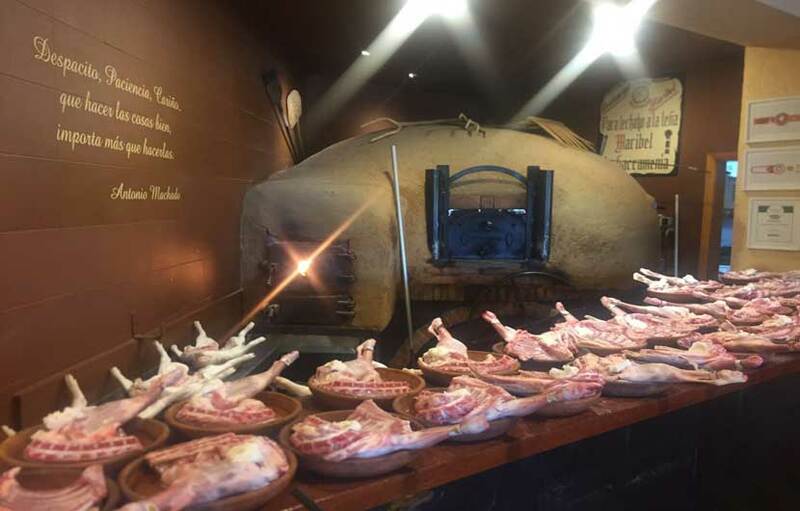 Asador Maribel Restaurante is one of the most famous restaurants in Segovia serving suckling pig cooked in a wood fired oven. They also offer an incredible variety of typical Spanish dishes including stuffed peppers, black foot cured ham, asparagus and salmon, lamb chops and braised beef cheeks. Restaurante Claustro de San Antonio El Real is located within the hotel of the same name. The setting is quite stunning and well worth visiting as a formal dining evening out. The signature dishes here include the famous suckling pig, fresh cod with cream of leaks and fresh tuna steak. Restaurante Taberna Lopez is located in Calle San Cristobal, 3 and is one of ht the most popular traditional restaurants in Segovia. Delicious roast and grilled meats are the order of the day here. Suckling pig, rib eye, sirloin steaks and roast baby lamb are all prepared beautifully and taste even better. Restaurant Casares offers a choice of some of the best local dishes located very close to the Aqueduct. The restaurant offers an interesting selection of starters, fish and meat dishes. Highly recommend is the set menu at €25 per person and offers a veritable choice of traditional bread and butter bean soups, suckling pig, codfish in plumb sauce and roast suckling lamb. The sumptuous desserts include Segovian sponge cake, rice pudding and home made egg custard. A top wine is also included in the price.